Anyone out there from the Cleveland OH area that is willing to show a friend of mine where the common leak spots are in his W123? Getting real tired of water! Will pay a small fee for discovering the source(s). He had some area around a grommet repaired I believe near the firewall. 5) Bulkhead area under the battery tray. Remove battery and tray to investigate this bit. Don't overlook the small drain-hole that is directly under the hood hinge pin in the pocket. You need to poke there with a piece of wire to find it! There is also plastic funnel glued under the wiper that catches and funnels water from the slit under the wiper to the trough. It fell off on mine! Is tehre a way for water to flow from the sunroof to the rear window channel? I get water coming from under the window in the trunk and the window is sealed well. 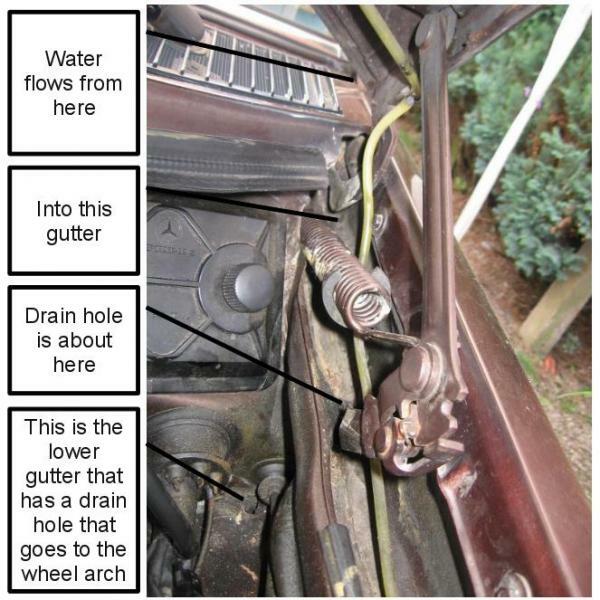 there is a rubber tube attached to the rear sunroof drain that is routed in the c pillar and if it's torn, or the rear drain is rusted out, it'll leak in that area.